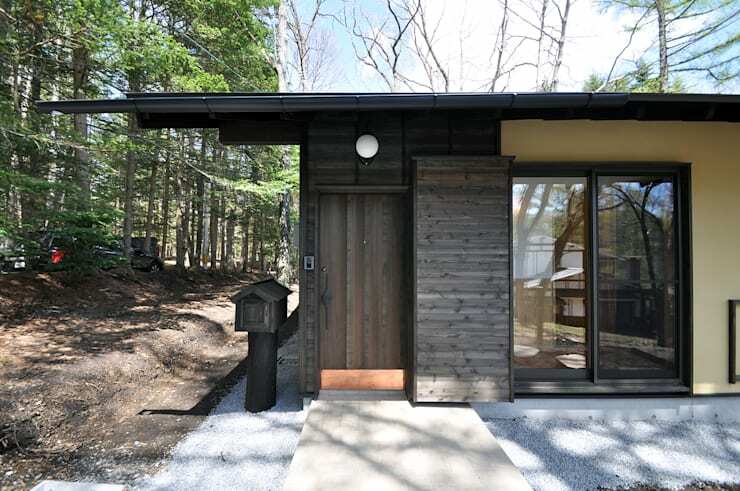 At about 650 square feet, this compact woodland cabin has everything that you need for a quiet getaway – and nothing that you don't! 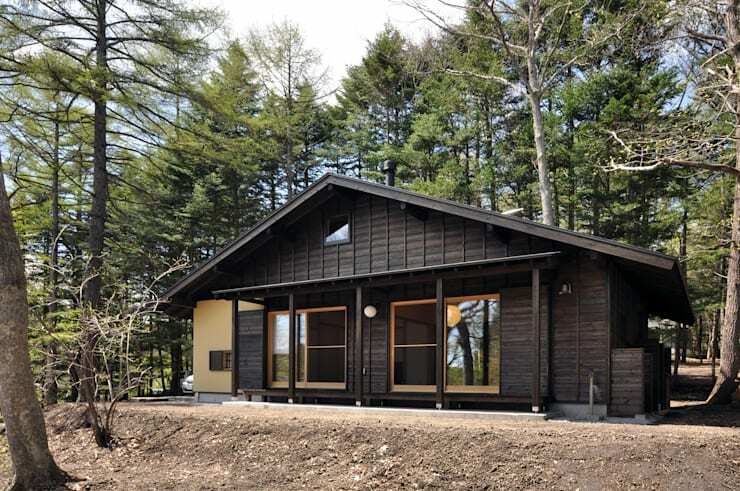 Architects from Morimoto Atelier have created the epitome of peaceful retreat in this balanced cabin design, reflecting the beauty of the surrounding nature by using a wide variety of natural materials in the home's design. 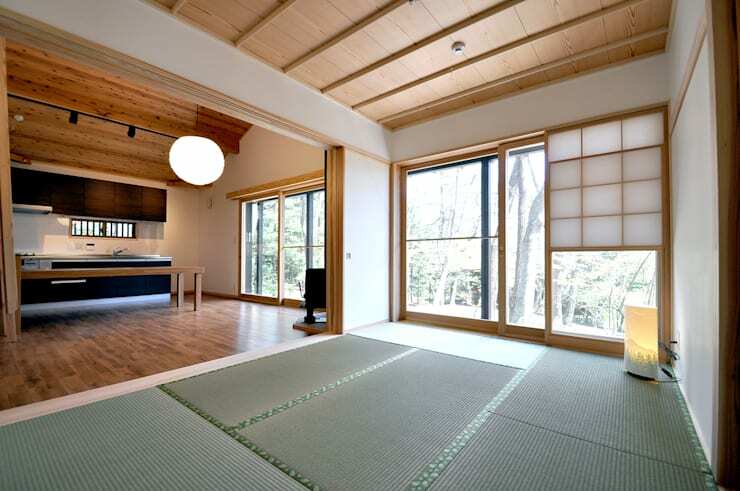 This home also speaks to the beauty of simplicity by adhering to a traditional Japanese minimalist design throughout the interior, creating a warm, serene space that offers the chance to simply be . All around this modern cabin, tall pines loom overhead, creating an instant sense of establishment for this newly-built home. 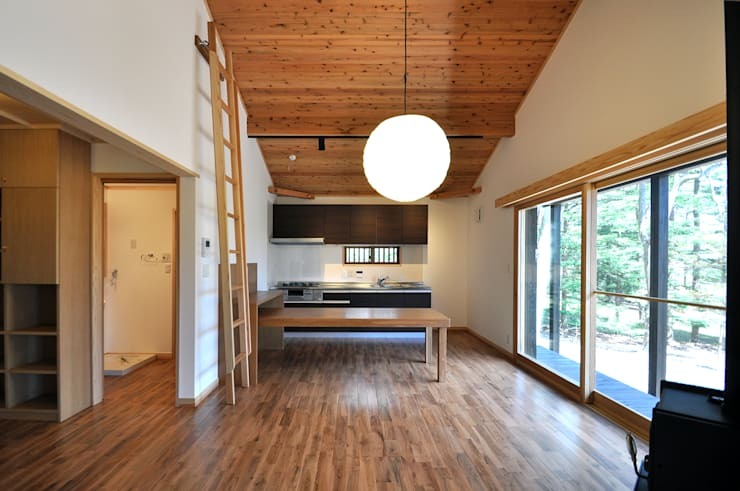 Designed as a peaceful forest home for a couple, the home occupies a simple rectangular space and adheres to a balanced, symmetrical design. The large windows on the front of this home speak strongly to this sense of symmetry, as their window panes are a mirror image of one another, falling on each side of a single central lamp that marks the centre line of the home. Avoiding the high-energy roof angles typical of a woodland chalet, this home employs a more relaxed, flattened roof design whose sloping angles seem to melt effortlessly in a downward direction, giving the home a well-grounded look. Although it's nothing ostentatious, this entrance offers a bright and warm welcome – despite the dark, chocolatey nature of the wooden exterior of the home. A round lamp illuminates the doorstep on dim evenings, while a mailbox that playfully mimics the home's design rests next to the front door in a friendly arrangement. In true minimalist style, you'll notice that the base of the home has been left unadorned with landscaped shrubs and flowers; instead left to its own devices with a simple covering of smooth white pebbles that provide drainage for the home's foundation. Unlike homes that twist and turn, this simple cabin offers itself up in the first glance – with nothing to obstruct your views, you can peer into the entire living room and kitchen from the entrance hallway. 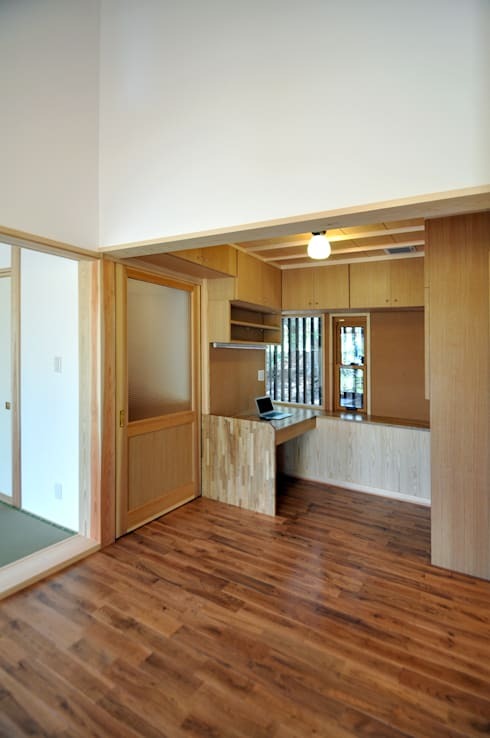 A traditional Japanese-style living room with padded floor and a lamp in the corner establishes a sense of culture in this minimalist space. Notable in this home's design is the juxtaposition of many types and sizes of wooden planks – you'll find a smooth, pale wooden ceiling in the living room, next to a golden, knotted kitchen ceiling and darker, richly varied kitchen floor – all of these styles speaking to the beauty of nature's ample variety. Walking through to the kitchen, you find that the home is heated by an efficient wood-burning stove – and the structure's open design makes this heating method highly efficient as heat is allowed to effortlessly reach every room. In fact, you'll notice that the upper floor of the home enjoys a large open space that connects to the kitchen above the stove, drawing heat into the upper floor at one of the most advantageous points. 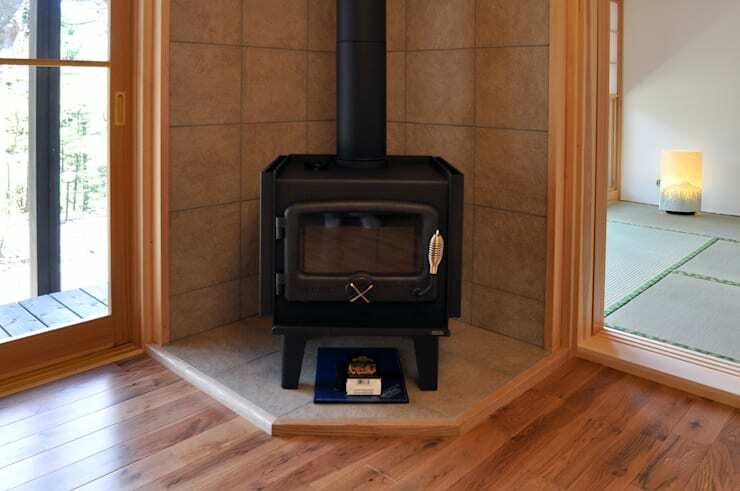 Working with the natural environment of this home, the architects have not only included this wood-burning stove to capitalize on the readily available fuel in the immediate area – they've also built the entire house to conserve as much heat as possible. Wooden floors, for example, make for a much warmer surface than tile or stone, providing a natural warmth to bolster the wood heating system. You might ask yourself what a ladder is doing stacked up on the side of this kitchen – in fact, the ladder is currently resting in its storage spot, and can be moved across the room to give access to the upper loft of the home (accessible through the square cut-out visible in the kitchen image above). Not only does this ladder provide an interesting and artistic focal point that lifts thoughts upwards, it also serves to physically elevate the residents in a dynamic, mobile, and highly practical design – while heat has trouble making its way up the 90-degree turns of an enclosed stairway, the heat has no trouble circulating to the upper floor through the rungs of a ladder. Truly practical in every sense, this home office offers convenient storage and a practical space to work without getting lost in over-the-top embellishments. Here, a small work desk is tucked away in the corner of the room, providing a sense of intimacy and quiet, while a large mirror on the wall opens up the space for clear thinking. With plenty of cabinets for keeping the space clutter-free, this simple home office is a prime example of an efficient and distraction-free workspace. 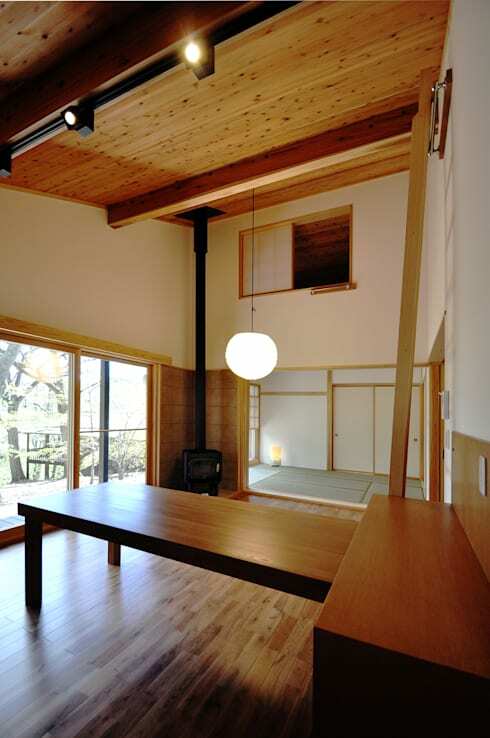 Traditional Japanese building styles draw heavily on the the belief that the simplest things in life are the most beautiful – if you like this natural and minimalist approach to architecture, have a look at this countryside home in the mountains of Japan. What do you think of this eco-friendly house? Comment below!